Can I Fight Holiday Stress with Massage? “The most magical time of the year” is quickly approaching. Can you feel it? You can surely tell, not by the whisper of jingle bells in the distance, or the smell of home baked peanut butter blossoms, but by the “magical” level of stress that arises with alarm every year around this time. The store ads implore us to buy copious amounts of “just right” gifts, the magazine holiday recipes assure us that making the perfect breakfast casserole will all but guarantee our family’s’ holiday happiness, and we tell ourselves that the guest room must be hotel-perfect for our holiday boarders. Sure, the preparations and festivities are often very special and fun, but the extra work and stress they bring are undeniable. We involuntarily bow a little under the weight of our own, and others’, holiday expectations. So what to do when you feel especially bowed over? Either you can opt to do away with some of the things causing your stress, or you can tackle your stress symptoms head-on. 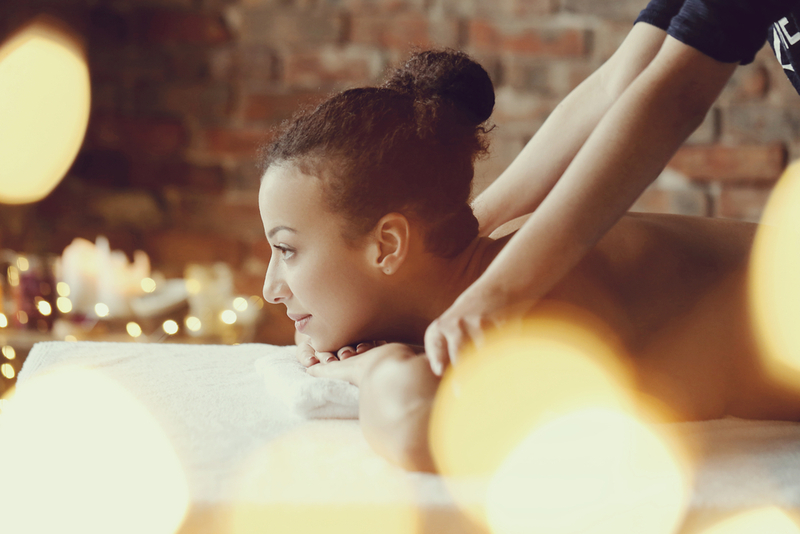 And given that you’re not likely to say a big “sayonara” to the in-laws camped out in your basement, we’d like to offer the top 3 ways that massage should be your holiday stress relief go-to. Massage gets in your head, literally. Unbeknownst to you, while you’re in foot-rub-euphoria, massage is benefitting your mind and emotions, too. Massage releases an army of feel-good hormones for a chemical-free mood boost. For one, massage releases endorphins which effectively calm your peripheral nervous system. Getting a massage also releases oxytocin, serotonin, and dopamine. Why is this significant? When your dopamine is low you’re more likely to experience self-doubt and a lack of enthusiasm. Lowered serotonin is linked to loneliness and depression. And oxytocin is often known as the hormone of trust and peace. We’re guessing you could use a healthy dose every one of these important hormones all throughout the holiday season. Want to get physical? Not with stress, thank you. Did you know that 75-90% of all doctor’s office visits are for stress-related ailments? The physical ramifications of stress are far-reaching, and not pretty. People carry their stress in all sorts of ways, from bowel upset, to chronic headaches, to elevated blood pressure, to chest pain. Not to mention the ways that you involuntarily tighten your shoulders or back as a stress response. Getting massage on a regular basis throughout the holiday season will help protect you, so that if you feel stress in your thoughts, your body won’t pay the price. Make it be about you. . . . just for an hour or two. Holidays are very “other-centered”, as they should be. The spirit of giving that comes alive this time of year is truly beautiful. However, you ought to remember to be selfish just a little. Don’t you deserve the gift of being good to yourself, just a couple times a month? Think about how much better equipped you’ll be to give to others once you’ve treated yourself to a therapeutic massage. We truly believe that you’ll be so thankful that you took the initiative to make regular appointments with your massage therapist this holiday season. The stress-busting effects of massage are numerous and impressive. And the fact that you get all of the benefits without taking medications? Now THAT’S a real gift.